Today is the first time I've had a chance to check out the new whitewater park on the Bear River that runs through Petoskey, and I have to say I'm very impressed. I've had a lifelong love/hate relationship with Petoskey, but this definitely nudges me toward the love side of the equation. I ran this river a few years back and it didn't go so well- I lacked the boat or the skills, and leftover rebar from removed dams punctured my boat in a spot way too close to home. The video of that run is pretty entertaining, especially if you'd like a laugh at my expense. This park is definitely a step in the right direction for the town and for the river. They've installed new pathways and pavilions, the new pedestrian bridge is well placed and they've installed several vistas and vantage points. What really impresses me is how they've redone the river, creating some killer standing waves and holes and creating yet another reason to visit Petoskey. This weeks high water is pushing the classification into the class IV range, with standing waves that are nearly 4 feet, and the run where I sank my boat is about 300 feet of frothing whitewater. Judging by the number of kayaks strapped to vehicles in town and parked at the takeout, it has gotten the attention of paddlers. I got there too late to photograph anyone in the runs, but will try to get there tomorrow to update this post. Kayaking is my other great love, and with this new park up and running, I may be tempted to get a play boat. This next video is very entertaining, it's a helmet cam view of the run done right by people who knew what they were doing. This is the old riverbed before improvements; note that the river is running much higher today. Congratulations to Petoskey for making a genuine improvement to the town. With foot and bike trails and lots of picnic areas, this is going to be one of the most popular places in town. Why build a wooden drift boat? Why go through all the hassle, hard work, dust, planning, planing and expense, when there's perfectly good glass drift boats on the market? Love- pure unadulterated love, for the fishing and for the boats. Anyone can build a flat bottomed john boat and call it a drift boat, but we know better don't we. Curves are what add interest, define the boat. Some lines are functional, aiding maneuverability and tracking, but some are there for you and me, an aesthetic statement of style and grace, a tribute to the flowing undulations and sinuous curves of the rivers and fish themselves. This is also about carpentry as an art form, not nailing 2X4's together, but taking a natural material- cedar, and shaping, nay, sculpting it in oblate form until it mirrors its aqueous medium, at harmony with the natural world that will be its home. When the work is done, the dust is gone, the sweat and worry washed away by the flow of a trout stream, all that is left is the glow of wood, the steady cadence of the oars, the banter of friends and an angler tucked in against the curve of the bow, casting for trout. I'm driving home, alone, late, having worked a long day. It is very dark and all is wet- wet fields, wet roads, wet grass. I'm wet, the dampness seeming to seep inside of me after days of rain. I'm in a funk- steelhead funk, as the weather has been uncooperative, with cold wintry weather stretching far into April, and now flooding rains, this the fourth blowout rain in ten days. In protest I've taken on yet another job, a small one, something to fill my time until the rivers drop. My friend Luke has sent me a picture from his phone, of flooded fields with a trout stream somewhere in the middle- it won't be fishable for a week. As I drive home alone in the dark, the fog lifting off the road surface, obscuring it, giving the illusion of flight, and I constantly check that I'm not veering off the road. As I pull through town, I see that the golf course is flooded- no grass to be seen under the sulferous lights, water standing in the right lane, now running in a torrent I dare not enter down the street. I stay left and go around it, eventually making my way home. It's late, but I stop and check on the chicks I bought today. Part of me wishes they were hackle birds, as Kirk Werner's Weekly Drivel post reminded me to check the price of hackle on Ebay, and I see that some grizzly saddles have topped out at over $400 in the bidding- ridiculous, but I hope that Keough, Metz and Whiting (and whoever else sells hackle) are making money. Someone has to. Maybe I should order some eggs from Alvin Theriault. My chicks are fine- they seem quite happy actually, their little home perhaps a bit more cozy than mine right now. Our relationship will be brief, these are meat birds. They're only cute for a day, by the way, and in 6 weeks or so they'll be 4-6 pounds and ready to eat, and extremely ugly- I don't get attached, I never do. Something about mucking out the chicken house a few times that tends to put a damper on my affections. That and the feed bill. I don't always mind the rain. I often bow hunt in the rain, and I fish in the rain every chance I get- it usually gets me some solitude, if not fish (and deer). This weeks rain, while slightly ridiculous, is a good thing. The rivers need it. The fish need it. It's good for the mushrooms. We didn't get enough snow this winter. I pull down my long driveway, shut the truck off and step out. I can smell the water- it smells like spring now, damp, earthy, and slightly green. The frogs are out in force finally, trilling so loudly that's it's a relief to go inside. I want to watch something on TV, but I have flies to tie, so I wander upstairs, sit down at my bench, and get started. I just wanted to pass along some news that I got from my friends at Rugby Lake Lodge that they're offering a discount on hunts booked before May 1. I know it's short notice, but if you're interested and can't commit before then, their regular prices are a bargain. Dave and Jacqui Haukeness run a great operation and the deer are huge. They are located on beautiful Rugby Lake northwest of Dryden Ontario in the heart of trophy whitetail country. I hunted with them in 2007 on a solo trip and can tell you it was incredible. The fact that I screwed up and shot a two year old buck (talk about ground shrinkage) doesn't reflect on the trophy quality of this area- they have big bucks, and they have them in spades. The picture I'm sharing of this other buck doesn't do justice to his true size- his rack wasn't much to look at, but he weighed close to 300 lbs. and looked like a linebacker- no neck. Ontario's deer are every bit as big as the other Canadian provinces including Saskatchewan, and Rugby Lake Lodge offers an incredible value at regular price- comfortable scenic lodging, great hosts, incredible hunting. Dave is a hunting machine and had 25 stands out when I was there. They also offer bear and moose hunts, and I hear the fishing in Rugby Lake is fantastic for walleye, lake trout and pike. If you've been waiting to draw in a place like Iowa or Kansas, or don't think you can afford Saskatchewan, don't overlook northwest Ontario and Rugby Lake Lodge. I have every intention of going back and archery hunting with Dave and Jacqui again- I'd do it annually if I could manage it. It was that good. Wow, am I late with the coffee today. It's incredibly good though. Today's coffee is Komodo blend, french press of course. I'm sitting here, way too late in the morning, trying to break through the crust of my brain. What happened? Excuses Excuses. I have them. It's too cold, the water's too high, the fish are late, I'm late. Yawwwwawwwn! Is it Monday already? I think I need to go back to work just to rest up. I did indeed fish a lot this weekend. Found very few fish. Had some adventures. I finally got Cardboard Kirk out. I went smelt dipping for the first time in 24 years- the first time there has been runs of any size since then. It was a blast from the past and a lot of fun. Oh, and I have contest winners to announce. Last weeks giveaway was a set of 6 of my favorite streamers. Congratulations to commenter # 8 Pat, and since I promised to draw two winners this week, congratulations also to commenter #12 Dustin's Fly Box. Send an address to fontinalisrising@gmail.com and I'll get those right out to you. So what's on tap for this week you ask? Well, I'll have yet another Croff Craft Chronicles post, I'll document my time with Cardboard Kirk, I'll be working on some technical changes for the benefit of all, and it looks like I'll be doing a solo kayak trip Friday into a wilderness area for the Saturday trout season opener here in Michigan, unless my buddy Keith decides he can make it. I don't care for the solo trips as much as I used to- I feel increasingly mortal as time goes on, but sometimes a man has to do. It's a reasonably calm stretch of water with some great fishing, so we'll see what happens. Hard to believe that Sunday will be May 1, so look for the latest installment on my Anglers Year series. Well, spring is doggedly making it's debut despite the cold, and I have a new job to start. Let's get after it. Astute reader Patrick sent me this photo after seeing my fly on my Monday Morning Coffee post. He'll get some bumper and gear stickers and a T-shirt (when I get them done). That's the joy of arbitrariness. 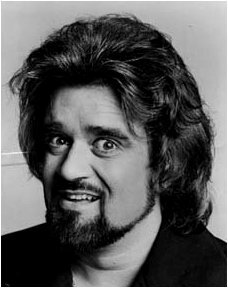 Wolfman Jack is one of those vague memories from my childhood, but I'm sure you can see the resemblance. Check out the gear/bumper stickers on my fly box- they're prototypes, but with some soon to come changes here at FR I'll have them available. Well, it's done. The flies are tied, the rods are de-rigged and re-rigged. The DeLorme atlas has been consulted, is ready to go. My work is finished, for a couple of days anyhow, and I'm ready to head out tomorrow on an all day outing for steelhead. I worked on the truck and fixed some things today and discovered more things to fix that can be put off until I'm done fishing. I have four rivers in mind, three of which I've never fished for steelhead, so this should be interesting. I haven't prepared that well- I'm lacking some groceries, but I'll get by on granola bars and gas station beef jerky. Maybe I can pick up a piece of smoked fish at one of the local shops. So, I'm up at 5, I'll make the coffee, load up and point the truck north. I don't have far to go, but I'm going to make the most of it- first light, boots in the river. I'm also going to keep a promise to a certain cardboard angler- Cardboard Unaccomplished Angler that is or simply CUA. The poor guy has been hanging out for like a month now. Too many things have conspired against me until now. A tough job deadline with 10-12 hour days, sickness, and bad weather and a late run. It's time to get Cardboard Kirk out after steelhead finally before sending him on his merry way. So wish me success. The rivers are still high and stained, and the nights are still too cold, but those fish are there, and I'm going to find them. Good night. I wrote a rather angry piece the other night entitled "Spare Us the Excuses" about the ongoing debacle concerning dam removal on the Pigeon River. I've learned not to post or publish when I'm angry. I- we- have reasons for anger however. I grew up on the border of the Pigeon River Country State Forest, ten miles from the river itself. The Pigeon River Country is a vast wildland, the home to our only elk herd (1000 head, give or take), an enormous playground for hikers, bikers, paddlers, campers, horseback riders, hunters, anglers and bird watchers. 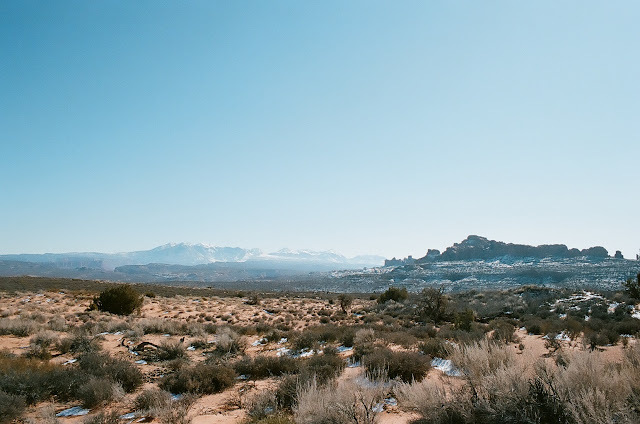 It's not wilderness, just a big usable wild playground, dotted with lakes, campgrounds and traced through with hiking and riding trails (no motor vehicles) and filled with wildlife. Right through the center of this runs the Pigeon River itself, a gem of a trout stream. I've kayaked almost the entire length of this river- it is one of the fastest, most difficult rivers in Michigan's Lower Peninsula. It is beautiful wild country. In 2008 the Song of the Morning Ranch accidentally discharged tons of sediment from the only dam on the river- the only dam in the state not directly supervised by the state. It killed thousands of fish, has negatively impacted an already damaged local economy, and the river still has yet to come back. This would be bad enough, an embarrassment to a state that doesn't need any, not in an economy that depends on recreational dollars. But this is the third time it has happened. Three (3) times. Three. Just making sure every one caught that point. After a judge ruled that the dam must be removed there is talk that the state may compromise with Song of the Morning Ranch (a yoga retreat) and Golden Lotus, the owner, on the exact extent of removal. There is talk of the dam structures being left in place and of possible continued negative impacts on the river. I have seen the aftermath of the last two discharges and the resultant bad effects on the river, the fish, and the local economy. No private entity should have this kind of ability to negatively impact a public resource, whether intentionally or through negligence. It's time for the dam to go, once and for all. I can't speak to the proposed possibility of parts of the dam structures being left in place, but I do know this- Michigan residents and anglers want to see this dam gone. I would like to see the impoundment completely removed, the river returned to a completely natural flow, with zero (0), ZERO possibility of future discharges. Song of the Morning has had all the opportunity to address the situation and 27 years to get its act together and take care of this. We don't need excuses, and we don't need half-measures that don't resolve this once and for all, or that leave possibility of future discharges. We'd like our river back. The drift boat build over at Croff Craft continues feverishly. When I got there this morning the gunnel rail and bow arch had been added. The gunnel rail goes a long way towards stiffening the sidewalls, and the bow arch is both decorative and functional- the front casting stanchion will be attached to it. The shot below gives a pretty clear view of the gunnel rail and bow arch in place. When I stopped by later Phil had added the seat box frame. The empty shell of the boat had been quite flexible, but the seat box has stiffened it considerably, and now it begins to take on the character of a drift boat. Phil spent some time going over quite a few innovations he's incorporating into this boat. For instance, those holes at the bottom center of the seat box are drainage holes for the water that always makes its way into the boat, but when you see the finished design, how the whole boat is designed to funnel water for easy drainage, you'll appreciate the level of craftsmanship at work here. I guess you could call them "aqua ducts" as these will allow easy drainage. Dry storage will be to the sides. To the left here Phil was showing me the seat placement. The seats themselves are beautiful. He ropes them with a rather fine cord stretched tight that is very comfortable. He explained some sort of arched slatted configuration that will allow the seat to be adjustable, AND accomodate the anchor rope- I'll have to see this to figure out what he's talking about. By the way, if you're interested in his boats, or would like to commission one, you can contact him on his website or at ccdrifter@mail.com. I've spent many hours rowing these and can tell you that they row like a dream. This boat is slated for completion by May 5, so it's going to develop rapidly. As in, I'm giving away 6 big streamers. I'll give away two of the Zoo Cougars I tied this weekend, two bunny leeches, and two of the lightweight shiner imitations I tie. Big food for big fish, and if you think they are too big for your favorite stream, you are probably wrong. Leave a comment below and I'll do the drawing on Sunday April 24. Entries are due by 7 PM Sunday. Below are the shiner imitations- I've perfected this tie now, but didn't have time to do fresh pics. The one at center right is representative of what's in the drawing. 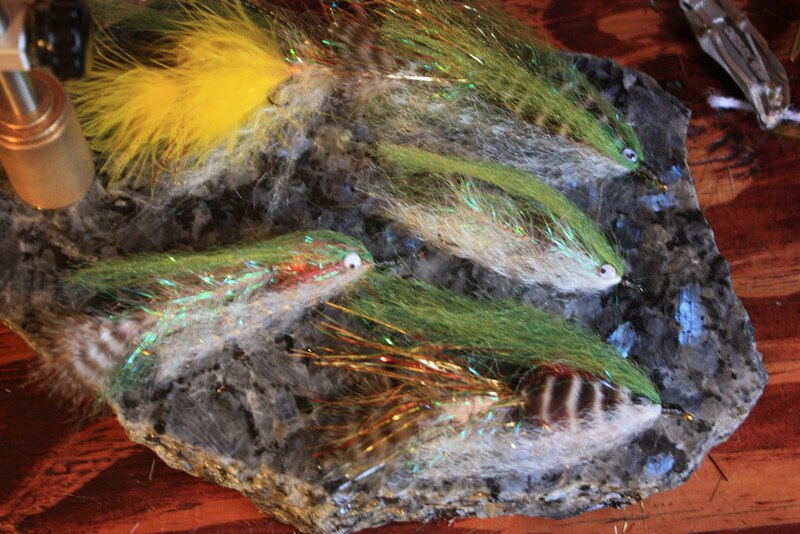 They're lightweight, cast a mile, with a good outline that looks like the actual muscle pattern on a baitfish. I think you'll like these. Again I'll throw in the disclaimer- I'm not a pro tyer, but I do catch fish on these. The steelhead and browns hammered these shiner patterns last fall, with the Cougar being a close second. So leave a comment to enter. I'll get Lorin the Drawing Girl to do the honors.